Read the review below or jump straight to the photos and videos! 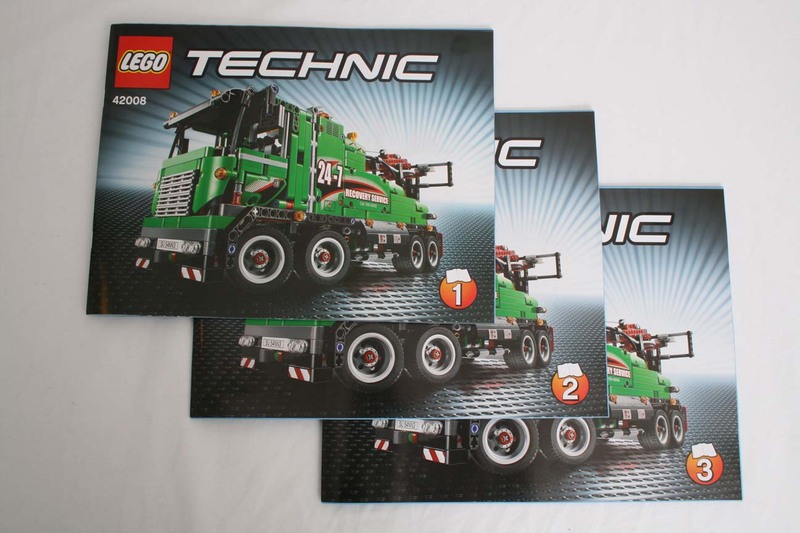 The LEGO Group kindly sent me a pre-release copy of the LEGO 42008 Service Truck Technic set to play with review. 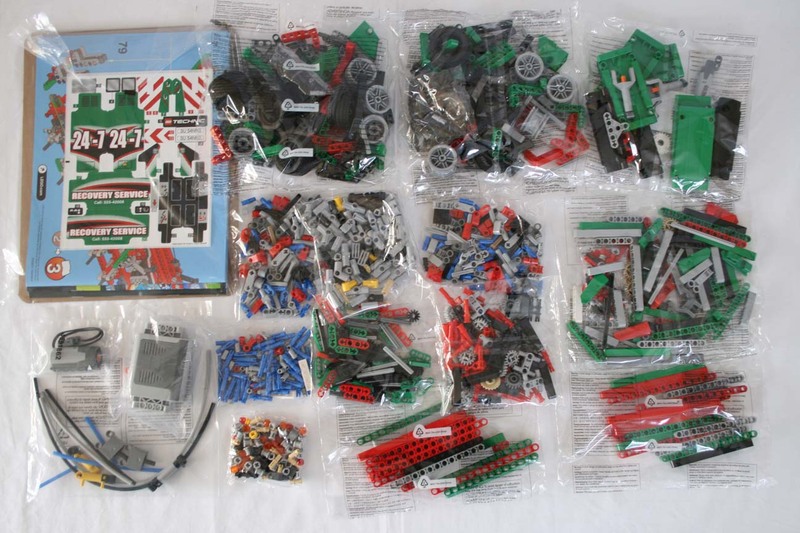 This is actually my first pneumatic set since my 8851 Excavator when I was a kid, and I was very keen to see how things have progressed since 1984! 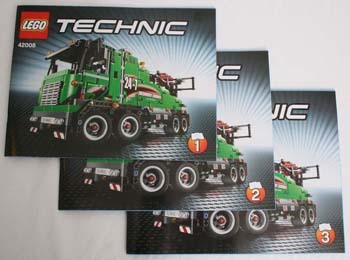 This set has also been reviewed by Techlug. Similar to the 42009, the back of the box has a couple of perforated sections which allow you to open the box without risking ripping the rest of the cardboard. The bags are not numbered, but the stickers are. The Panel Fairing #21 and #22 (Very Small) now comes in Green. 32524 Liftarm Beam 7L in Green. 40490 Liftarm Beam 9L in Green. 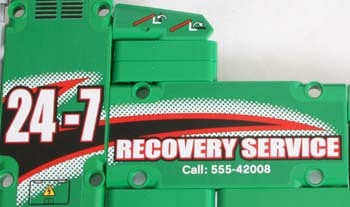 41239 Liftarm Beam 13L in Green. The 11x3 Curved Panels are of the old type, not the new ones seen on the 42009. This was a fairly straightforward build, it took me about 5 hrs spread out over a week. This is the first build I've done that combines pneumatics and power functions so I was quite interested in seeing how it all worked. It's nice to have lots of moving parts that are not just gears. 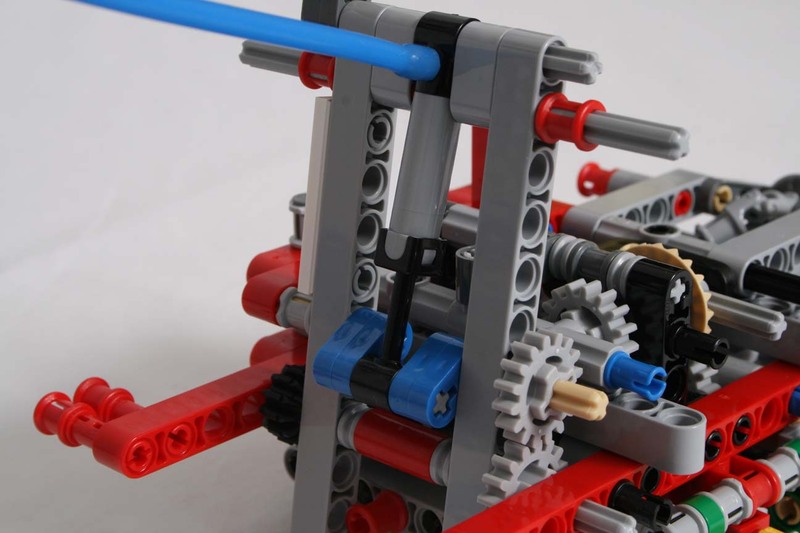 The linear actuators combined with pneumatic cylinders leave you with a nicely compact assortment of moving beams. Once it is all framed by the green panelling it starts to actually look like a truck. I always apply stickers to my builds as I rarely create MOCs or if I do then I don’t particularly care if they have weird stickers on them. However, it struck me with this model that there were a LOT of stickers. In fact, all 3 of the 11x3 Curved Panels have them, 4 out of 5 of the 5x11 panels have them and 2 out of 6 of the new very small panels have them. Even the side mirrors have them which I think is completely unnecessary, especially since you can't even see it most of the time. The Techlug review has some great photos of the set without stickers if you want to see what it looks like bare. There was something I came across that surprised me greatly as I've never seen it before – an error in the instructions! 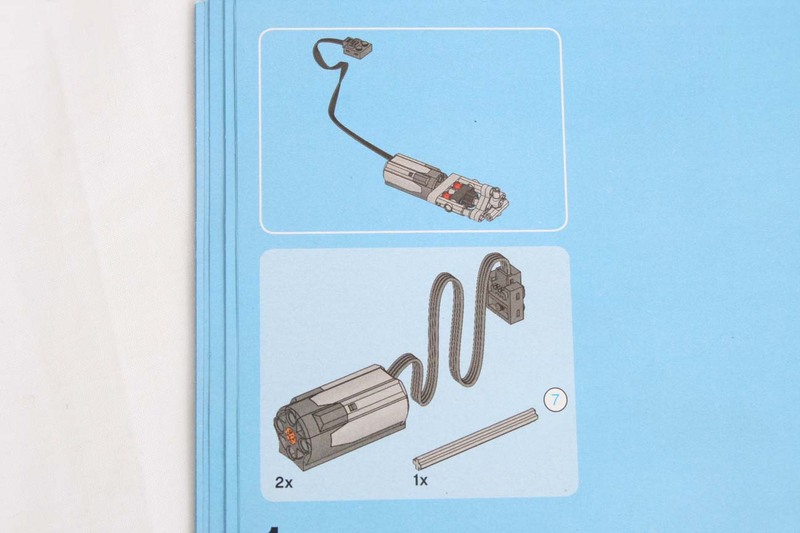 In book 1 on page 60, the parts list says that two motors are required when it is obvious you only need (and have) one. Perhaps I’m seeing this because it is a pre-release set, and they will fix it quickly before mass release. It's lucky in a way that it was such an obvious error, if it had said an extra pin or bush I would have spent hours trying to figure out where it goes and believing I'd done something wrong. 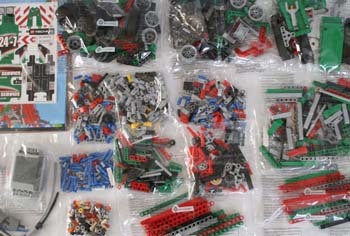 After all, the known high quality of LEGO components can hardly be questioned! The new pneumatic parts have certainly evolved since the last time I used them (mid-80s!). Also, the tubing is pre-cut to size whereas you used to have to cut them manually. 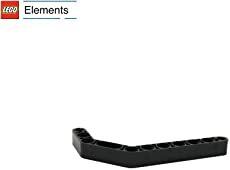 The small spring-less pump is the same as that introduced by the 8110 Unimog U400. It is spring-less because it is designed to be driven by a motor for much faster and more powerful operation. I’m assuming the pump has a one-way valve inside it so that air is pushed out on its downward stroke but not sucked back in on its upward stroke. When I dismantle it for the B-Model build I'll do some testing with it. When the build was completed, this piston pump made some interesting noises. I'm not sure if it was banging into the parts around it or if it was the internal parts of the pump banging together. Check out the video to see what I mean. These new small cylinders have quite short arms compared to the old larger ones. 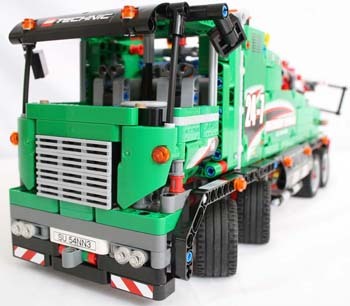 However, there was some creative use of beams that meant short piston movements could result in larger beam movements such as with the extending arm on the top of the truck. The two curved 11x3 black panels hide the power function switches and have stickers on them to indicate which position does which function. 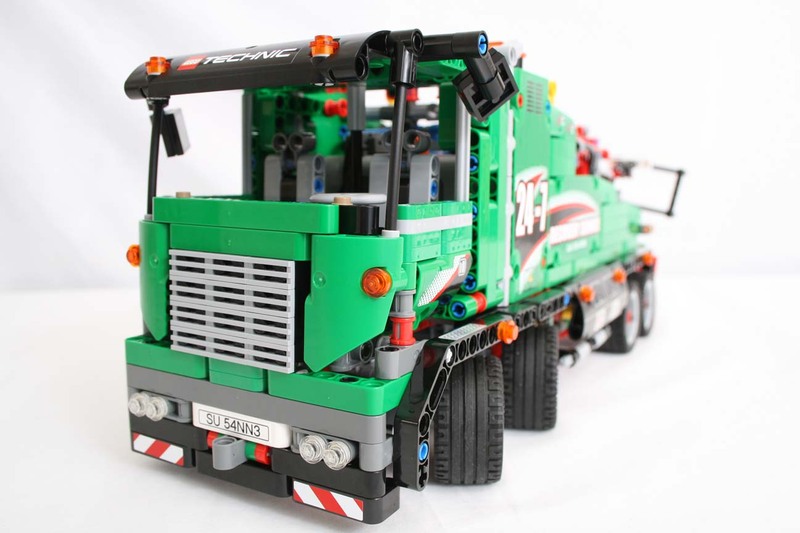 Extending the rear stabiliser will lift the back of the truck just enough to freely spin the last axle. Extending the hook is a bit fiddly. 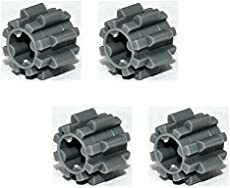 There is a lever designed to stop the hook from getting pulled out by force when it is under load, by preventing the black bevel gear from turning. However this means that to extend the line, you need to turn the motor on, then lift the lever with one hand while pulling out the string with the other. 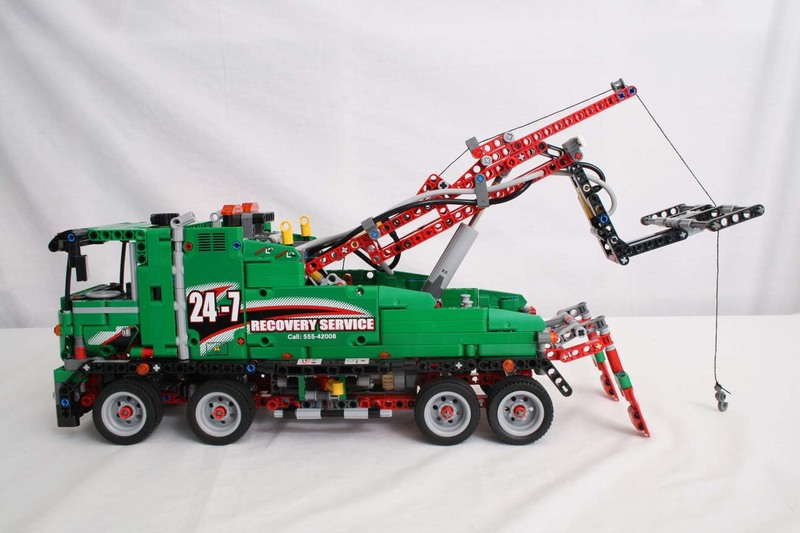 The lift-arm can be extended and hook deployed if required to help move the broken down and possibly partially destroyed vehicle into a better position. 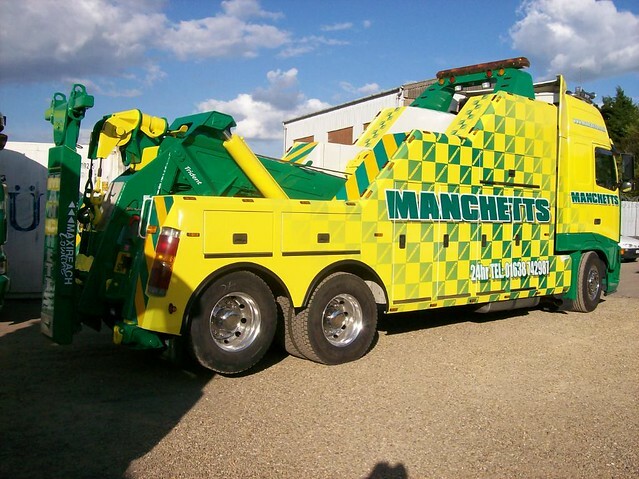 The stabilisers are extended to give the recovery truck some support. 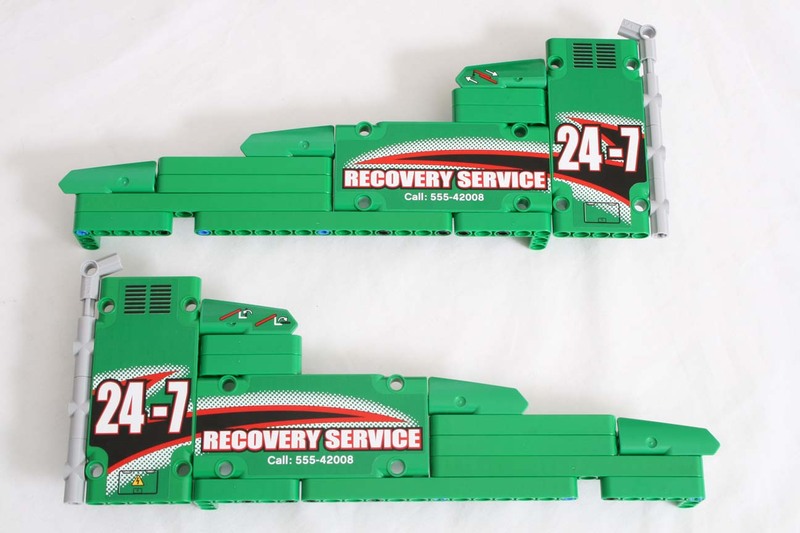 The bottom under-lift part goes under the broken down vehicle. 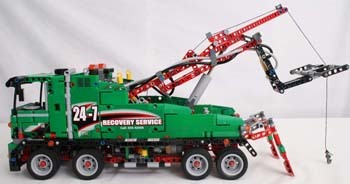 The lift-arm and under-lift is then raised to get the front or back end of the broken down vehicle off the ground for towing. Dropping the under-lift didn’t require power. After raising it, simply moving the pneumatic switch to the right position dropped it with a hiss of air. Is that supposed to happen? There is one Clutch Gear used on the string and hook, but there definitely needed to be one on the main drive shaft as well. 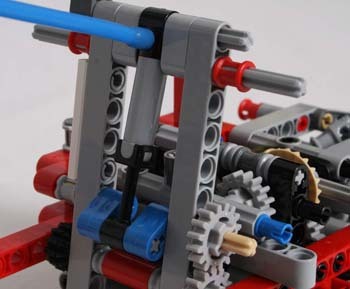 All of the actuators make the horrible clicking sound when they reach their limits, as the gears slip. 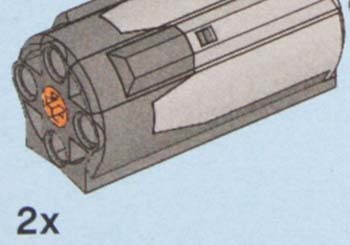 The Clutch Gear is designed to stop that by slipping internally when the load gets too high, so it's a wonder why it wasn't included. EDIT: I'm told this may be the internal safety clutch in the actuators making that noise? Still sounds horrible! This is definitely a good looking truck, and I love the colours. I could not find any images of the real life truck it is supposed to represent though, so am not sure if they are real colours or not. The new very small fairing panels are neat and will allow for some great looking MOCs and more detailed panelling in the future. Do I like it? 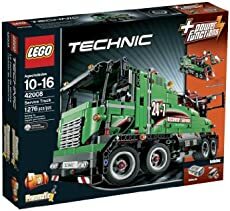 Well I can't help but look at this truck and compare it to the 8851 Excavator which was my first pneumatic set and one of my top 3 sets of all time. 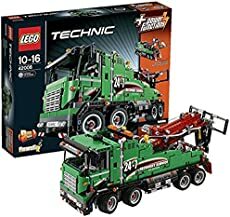 The 8851 was a tricky build with lots of hoses crammed into a small space, and playing with it wasn't all that interesting as the manual pump caused the movements to be jerky. But it was the stuff I came up with in free play with the pneumatic parts that made the set interesting. I recall creating a locked safe with a maze of hoses and switches that required the right combination to open. It was a great learning experience. I'm looking forward to this and the the new xl crane. I'm thinking its based on one of these..